On the bark of a lichen laden tree, this katydid disappears in plain sight. As we continue our escape from winter in Maryland, this week we hopscotch across Belize and Costa Rica in search of cryptic insects in the rainforest. In previous episode we met clever katydids, giant leaf insects, proscopids, and walking sticks masquerading as leaves and twigs to avoid detection by visually astute predators. Eons of selection has resulted in greatly elongated legs and bodies, expanded appendages, cryptic coloration, and stealthy behaviors that enable these illusionists to blend in with vegetation, often leaves of plants on which they dine. Another group of organisms call forests their home. These are lichens, a symbiotic relationship between fungi and algae or cyanobacterium. As in all symbiotic relationships, there is a mutually advantageous give and take between these organisms. The fungus provides the algae or cyanobacterium with a structural home and the algae or cyanobacterium provides the fungus with the goodies of photosynthesis – carbohydrates needed for growth and reproduction. Trunks of trees in tropical rainforests are replete with a dazzling diversity of lichens. These provide an opportunity for many kinds of insects to hide in plain sight from their natural enemies. In a hand, the wondrous colors and patterns of a lichen mimic katydid are more easily seen. 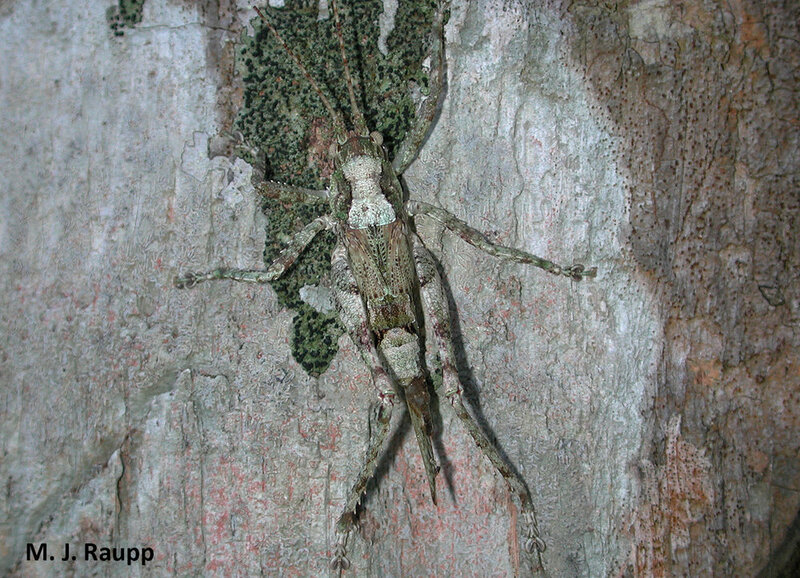 Near the Mayan ruin of Cahal Pech in Belize, a remarkable katydid did its best to resemble the lichen encrusted bark of a tree. This master of disguise certainly looked nothing like a tasty meal for a hungry bird or lizard. Katydids like this one are relatives of the common bush katydid that we met in a previous episode. Most katydids make sound by rubbing a structure called a “file” found on one wing against a second structure called the “scraper” on the other wing. The resultant vibrations produce the katydid’s song. 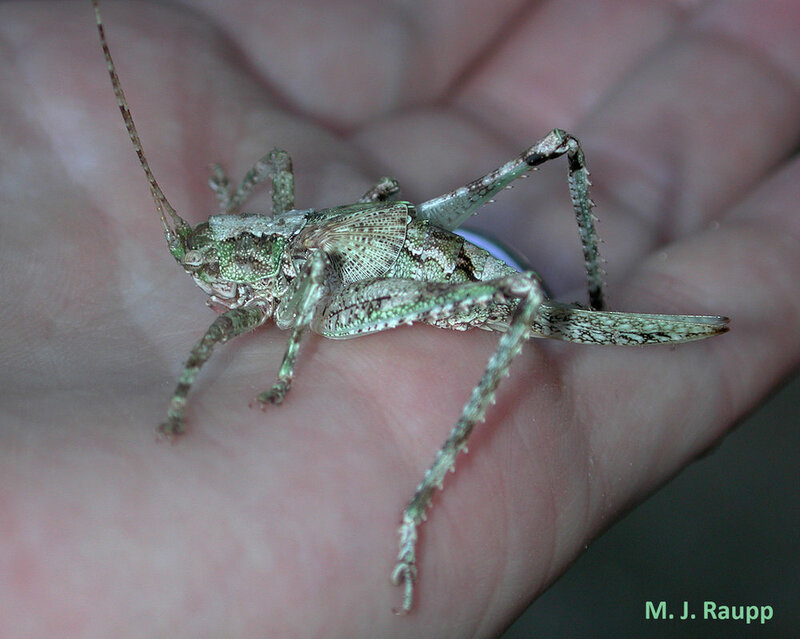 I noticed that our lichen-colored Belizean katydid had very tiny wings. I wonder if it sings very tiny songs. Nightfall in the rainforest near Bajos del Toro in Costa Rica provided an excellent opportunity to witness a second lichen mimic resting on the bark of a tree. While blundering through the rainforest I spotted a couple of small twigs that looked out of place on a tree trunk. These were the legs and antennae of a longhorned beetle hiding among the lichens and moss covering the bark of a tree. As adults, longhorned beetles eat leaves and fruit, but the larvae have powerful jaws that enable them to bore through wood and feed on plant tissues beneath the bark of branches, trunks, and roots. The blotchy pattern on the outer wings of the beetle were a spot-on match to the bark on which it rested. On the lichen and moss covered bark of a tree, a cryptic longhorned beetle blends in beautifully with the background. Our final stop on this week’s tropical excursion is the lowland rainforest of Tortuguero, Costa Rica. Wandering through the forest at nighttime with an eagle-eyed guide, we happened upon an ancient tree with mottled bark. Fortunately, an LCD light passing across the trunk of the tree revealed an unusual shadow. Upon closer inspection the light exposed a gorgeous lanternfly. The outer wings of this little beauty were a fitting match to the green and gray organisms festooning the russet colored bark of the tree. The only clear tell that revealed the lanternfly were its brilliant scarlet eyes. Having been outed by the cameras and lights of curious humans, the lanternfly disappeared into the canopy of the tree. Nighttime in the rainforest often reveals creatures not seen in daylight. If an opportunity presents itself to enjoy such an adventure, the Bug Guy highly recommends it. Subtle shades of russet, dark bands, small green patches, and white spots adorn the wings of this lanternfly as it rests on the similarly mottled bark of an ancient tree. After a few minutes posing, the lanternfly escapes the lights and cameras of the entomological paparazzi. Bug of the Week thanks rainforest guide Louis for nighttime safaris in Tortuguero and the hearty crew of BSCI 279M: Tropical Biology in Belize for providing the inspiration for this episode.